I periodically explain that pro-market policies are the best way of helping poor people. The reason rich countries are rich is because they had lengthy periods of limited government, free markets, and the rule of law. And the convergence literature shows that the same thing is true for developing nations. Today, let’s look at some new research from the World Bank on how good policy plays a role in generating wealth from natural resources. The authors start by explaining the issue they want to investigate. The literature on economic development often assumes that natural resource endowments are exogenous. …the resource economics literature has emphasized that the resource base is endogenous to investment in exploration and extraction. That literature has, however, overlooked the role that market orientation and institutions play in driving investments in the resource sector. Our aim is to bridge the gap between these two literatures and explore the effect of market orientation on the discovery of proven (known) natural resource wealth. They cite the United States as an example of a country that benefited from the right policies. And they note that there is additional anecdotal evidence that liberalization produces good results. Anecdotal evidence suggests that increased market orientation was followed by increased discoveries across continents and types of natural resources (see Table 1). The increase in discoveries after countries open up to the global economy appears to be quite stark. In Peru, for example, discoveries more than quadrupled, in Chile they tripled, and in Mexico they doubled. In Ghana, discoveries only started to occur after the opening of the economy. Here’s a table showing the dramatic increase in discoveries after selected nations shift to a pro-market approach. The authors want to see if such results are either random or policy-driven. So they put together a detailed model and gathered lots of data. …we put forward a simple two-region model of endogenous reserves based on Pindyck (1978) where multinational corporations are faced with an implicit tax which proxies for how closed market orientation is, and seek the lowest cost location. The model explores the interplay between market orientation and other channels such as the increase in the marginal cost of discoveries and (demand driven) natural resource price shocks. 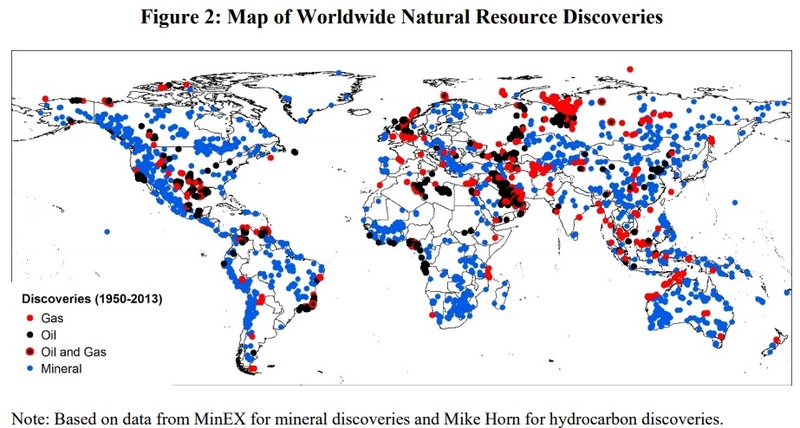 …For our empirical analysis we build a unique and hitherto unexploited dataset of the universe of world-wide major natural resource discoveries since 1950, covering 128 countries, 33 types of natural resources and over 60 years. Here’s an example of the data they utilized. I’m not surprised to learn that good policy (i.e., free markets) generate a substantial increase in economic activity. …our empirical analysis shows that market orientation causes a statistically and economically significant increase in natural resource discoveries. Our point estimates indicate that going from a closed to an open market orientation increases discoveries by 80-140 percent. 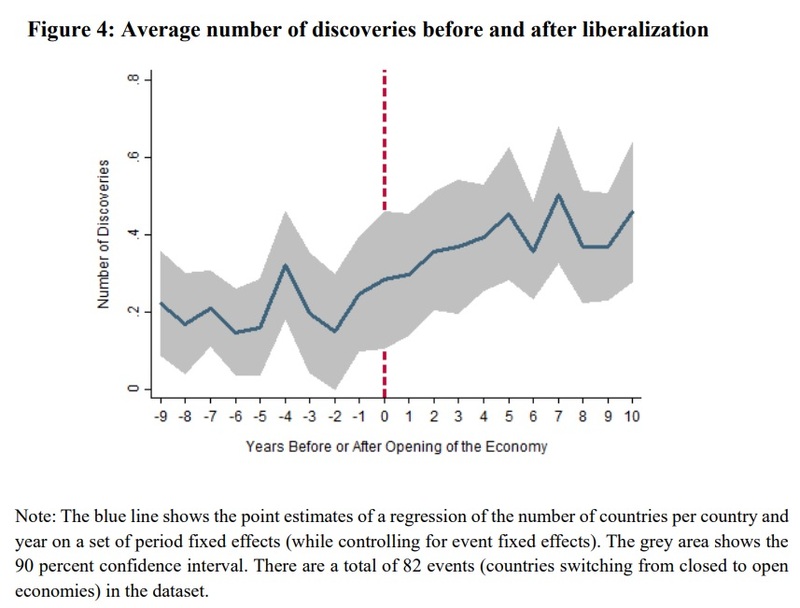 …In a thought experiment whereby economies in Latin America and sub-Saharan Africa remained closed, they would have only achieved one quarter of the actual increase in discoveries they have experienced since the early 1990s. The benefits are especially significant in developing nations, where market reforms appear to have produced a four-fold increase in the discovery of natural resources. Here’s a look at the data for the entire study. As you can see, there’s always an element of randomness and uncertainty in econometric research (“noise”), but the trend is readily apparent and the statistical tests provide a good amount of confidence about the strength of the relationship between more economic freedom and more economic activity. I have two takeaways from this research. First, we have the obvious result that property rights, rule of law, and other market-based policies are needed to help the poor. Second, this is additional confirmation of my gut feeling that the World Bank is the best (least worst?) of the international bureaucracies. Yes, they waste money and are capable of producing bad research, but the organization’s culture seems to be focused on what changes are needed to help poor countries. And that often results in solid research (for other examples, see here, here, here, here, and here). You can occasionally find good analysis from other international bureaucracies, such as the OECD and IMF, but it’s far more likely that those organizations will promote statist analysis because of a pro-government mindset. I agree 80%. Limited government, free markets, and the rule of law are certainly necessary for a country to become rich or stay rich. But they’re not quite sufficient. What’s missing is that the people in that country also have to respect the right of property — enough that practically nobody steals. I’ve heard from multiple people who lived in or visited southern or western Africa that those countries can’t have functioning advanced health care or manufacturing because every business or institution becomes a target of theft by everyone, including employees and visitors. Indeed if you work there, your family members will demand that you steal and give them some of the proceeds. I submit that a country with that kind of popular culture can never become rich, because no one in his right mind, including local residents, will ever invest there. In my mind this is a strong argument in favor of colonial rule, of the kind that was done to the US. And I hope that some day it will be economically possible again. Just look at the US vs Argentina. Similar endowment of natural resources per capita (if anything more natural resources per capita in Argentina). Yet very different trajectories. Switzerland: No natural resources and a hostile natural environment. Yet market policies and small government brought top prosperity. The reason rich countries are rich is because they continued to grow faster than the world average — long after achieving their initial prosperity advantage. How many rich countries are growing faster than the world average (about four percent annually) these days? Once voter-lemmings achieve a certain level of prosperity they become complacent into redistribution. Consequence: An arithmetically deterministic trajectory to decline. Sure, most individual countries experience an almost serendipitous sequence of growth trajectories, but the world average (having a lot less statistical noise) remains on a rather steady growth rate with rising trendline. When in human history has the world ever had a growth trendline of four percent sustained for several decades as it has now? World growth not only continues but the exponent itself seems to be growing. Who will keep up? The clock of ascent and decline is ticking ever faster. That is why average world growth is the yardstick by which countries are clearly separated into ascending and descending. Is your country growing faster than the world average? If yes then you’re ascending, your prosperity ranking is improving. If not, you’re in decline, your prosperity ranking is deteriorating against a much faster rising backdrop. Ride the growth wave. Keep your money, your vitality, and even your very self mobile. The world is changing and continues to accelerate to never seen before growth velocities — much faster than most western world voter lemmings realize. PS. The US is one of a few countries that has individual mineral rights, as opposed to collectivized, i.e. socialized, mineral rights.